Building on our pioneering enzyme-mediated sand consolidation, Cleansorb is developing a new generation of chemical consolidation for use in-situ across a broad range of upstream applications. Traditional mechanical intervention to remediate wells and optimize production can be prohibitively expensive, and in certain cases also limit production rates. Remediation of deteriorating propped fracs. Using novel decarboxylation reactions to overcome the limitations of current systems, Cleansorb’s technology has shown positive results in independent laboratory tests carried out on behalf of an operator. Fines migration was successfully prevented, without any significant reduction in permeability of the cores. This technology will deliver significant benefits for operators looking for innovative, cost effective methods of completion and stimulation. 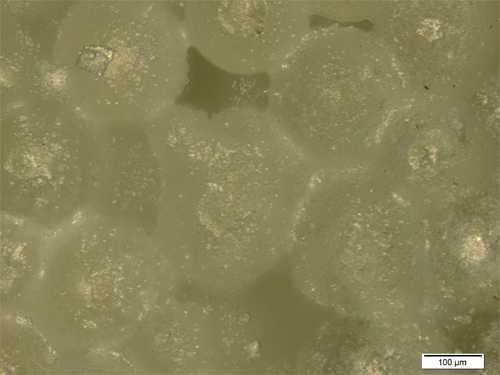 Below shows the results of using one of Cleansorb’s sand consolidation processes on a model system using glass beads. These have been stuck together using a treatment solution from which calcium carbonate is deposited. Loose glass beads are shown on the left. Following treatment with a fluid which delivers controlled deposition of calcium carbonate a consolidated mass of glass beads is produced, as shown on the right. 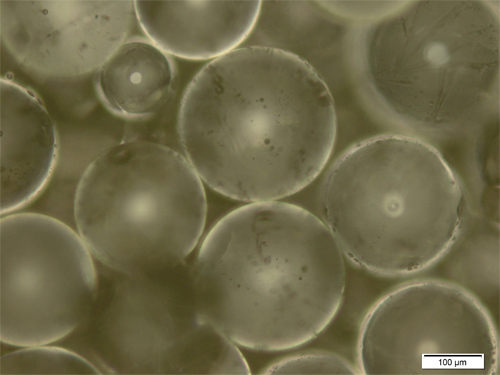 A white layer of calcium carbonate is deposited on the surface of the glass beads which sticks them together, as shown under a microscope (images below; unconsolidated glass beads are shown on the left, consolidated glass beads on the right). Contact us for more information on the commercial potential of this technology. Read the article here for additional information on the technology itself.